The Kitchen Koop is a cookware supplier and gourmet shop located in Portsmouth, VA. In over 18 years of serving professional chefs, home cooks, and foodies, we have become one of the most trusted names in the food industry when it comes to providing cooking products. Be it kitchen tools or cooking ingredients, count on us to give you no less than the best products available on the market. Deon Foster is a Le Cordon Bleu-trained chef. She lived in Florida, Hawaii, Tokyo, London, Germany, North Carolina, and Virginia, but was raised in Baltimore, MD. Her gourmet dreams led her to the famed le Cordon Bleu Culinary Institute in London. With her love for food, she finds purpose and joy by sharing her knowledge about it. 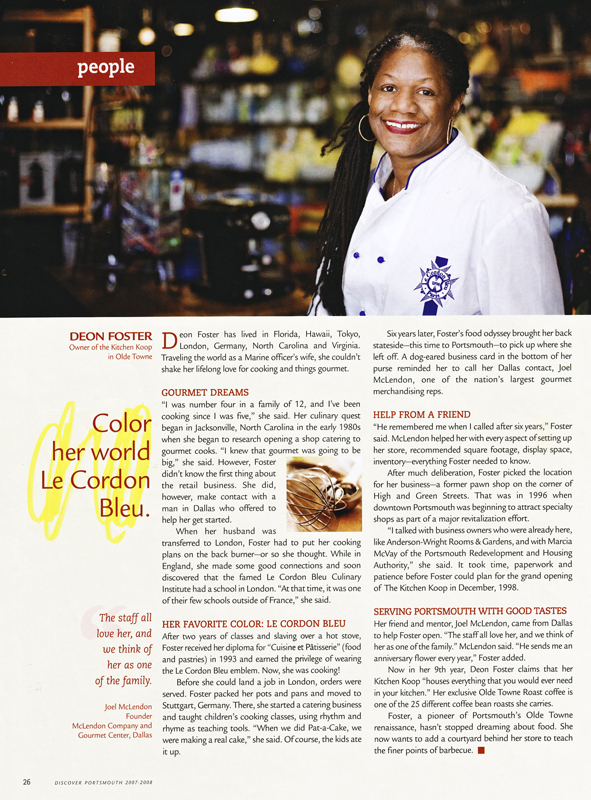 Many years later, her food odyssey brought her back to America—this time, to Olde Towne Portsmouth, VA. With her guidance, we provide cooking classes and offer a gourmet food line that will surely to please your palate. Our shop's grand opening was last December 1998. Eighteen years later, our kitchenware, gadgets, gourmet specialty foods, and coffee and tea products are enjoyed all throughout Olde Towne Portsmouth and beyond. We are a registered dealer of trusted kitchenware brands such as Stonewall Kitchen, Wind & Willow, and William Bounds. In addition, we carry our own labeled line of jams and jellies. Come visit our shop—The Kitchen Koop is where the heart is! Find durable kitchen tools and unique food items each time you turn to The Kitchen Koop for your cooking needs. Make us your official cookware supplier today. Should you wish to learn more about our cooking products, feel free to contact us. We are more than happy to answer your queries.